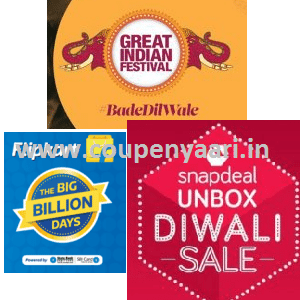 Schedule Diwali Sale 2016 : Flipkart, Amazon & Snapdeal Has Announced Its Annual Diwali Sale Between 1st – 6th October 2016 At Online Shopping Platform Flipkart, Amazon & Snapdeal.So This Year Flipkart Big Billion Day 2016, Amazon Great Indian Festival Sale 2016 & Snapdeal Unbox Diwali Sale 2016 Is Once Again Coming In The Month Of October 2016 With Amazing Offers On Mobiles ,Laptops & Other Electronics Products. And Flipkart Big Billion Day 2016, Amazon Great Indian Festival Sale 2016 & Snapdeal Unbox Diwali Sale 2016 Will Be Available On Both Mobile App And Website . Bank Offers Can Avail Extra Instant 10% Discount . Ab ITNE Mein ITNAAAA Milega Because India’ Biggest Sale Is Back. So This Festival Season Shop A Little More With The Same Budget. 15% Additional CashBack on purchases on the Amazon App between 01st to 05th Oct, 2016. 10% Additional CashBack on purchases on the Amazon Website & Mobile site between 01st to 05th Oct, 2016. Offer Also Valid on Easy EMI purchases. Offer is valid only on transactions of Rs 6000 & Above. Max CashBack per Card is Rs 1500. Offer Not valid on Corporate & Commercial Cards. India’s Biggest Flipkart The Big Billion Day Sale will start from 2nd Oct to 6th October 2016 for 5 Days only on Flipkart wbiste. There will be discount sale across 70 Categories from Mobiles, Cameras, Laptops, Clothing, Footwear, Watches, Appliances, Baby Products, Books, Furnitures, Jewelry & more. Additionally There will be cashback offer for SBI bank customers. This year 2016 Sale will be for 5 days compare to only 1 days in 2014 and 5 days in 2015. This year offer will be for all users, Website and App. Last year Sale was restricted to onlyFlipkart Mobile Appusers. Snapdeal, the leader in E-commerce of India after rebranding is back again and offering The Great Unbox Sale Up to 70% Off on Mobile, Electronics , Home, Fashion & more. Happy Shopping.